Minister Kirsty Duncan makes $141 million funding announcement at Queen's University. Speaking at Wednesday's announcement were, from left: Graduate student Christine Moon; Minister of Science and Sport Kirsty Duncan; Principal and Vice-Chancellor Daniel Woolf; Professor Lee Airton; Associate Vice-Principal (Research) Sandra Den Otter; and SSHRC President Ted Hewitt. 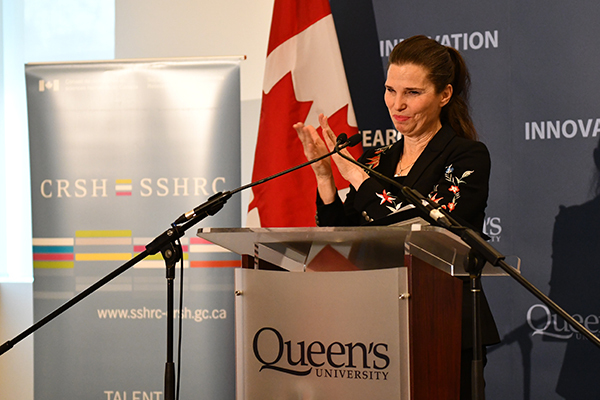 More than 90 Queen’s University researchers, including faculty, graduate students, and post-doctoral fellows, are the beneficiaries of Social Science and Humanities Research Council (SSHRC) funding announced Wednesday by the Honourable Kirsty Duncan, Minister of Science and Sport. At an event hosted by Queen’s at the Agnes Etherington Art Centre, Minister Duncan announced $141 million in research funding for almost 3,000 researchers across Canada through the SSHRC Insight Development and Talent grant programs. A total of $4.6 million is earmarked for Queen’s researchers. Minister Duncan was joined at the event by SSHRC President Ted Hewitt, and Queen’s Principal and Vice-Chancellor Daniel Woolf. Speaking on behalf of recipients across Canada at the announcement were Queen’s faculty and student representatives, Lee Airton (Education) and Christine Moon (Kinesiology and Health Studies). Dr. Airton’s research explores how gender expression is being explicitly defined, and implicitly constructed, in the human rights, diversity and equity policy documents of Ontario’s 76 publicly-funded school boards. • A total of close to 2,300 social sciences and humanities scholars at the master’s, doctoral and post-doctoral levels will benefit from today’s announcement. • In addition, 677 faculty researchers and their teams received Insight Development Grants. This number represents a 74 per cent increase from last year. • Queen’s University is one of 79 universities to benefit from the $141 million to support close to 3,000 researchers at institutions across Canada. • The Social Sciences and Humanities Research Council’s (SSHRC) Talent and Insight programs support post-secondary based research and research training in the humanities and social sciences. • The Canada Graduate Scholarships are awarded by the three granting agencies – SSHRC, the Natural Sciences and Engineering Research Council, and the Canadian Institutes of Health Research. Moon, a MD/PhD in sociocultural studies at the School of Kinesiology and Health Studies, will examine medical assistance in dying, and what assisted dying means to racialized Canadians. This is the first ethnographic analysis of assisted dying in Canada. "It is my intent that my research will contribute both to Canadian public policy and to the everyday lived experiences of Canadians," says Moon. "I am grateful for the support I receive from SSHRC, and the opportunity I have been given to better the lives of Canadians with my research." After the formal presentation, the podium party, including Minister Duncan and Dr. Hewitt toured the Art of Research photo contest exhibit. The annual photo contest is a unique opportunity for faculty and students across disciplines to showcase their scholarship in a non-traditional way, and a number of the exhibitors were present to highlight their research projects. For a list of all the funding recipients visit the website.